Oakland police have detained robbery suspects following a vehicle pursuit on Thursday afternoon that went through the city and a portion of Interstate 880. 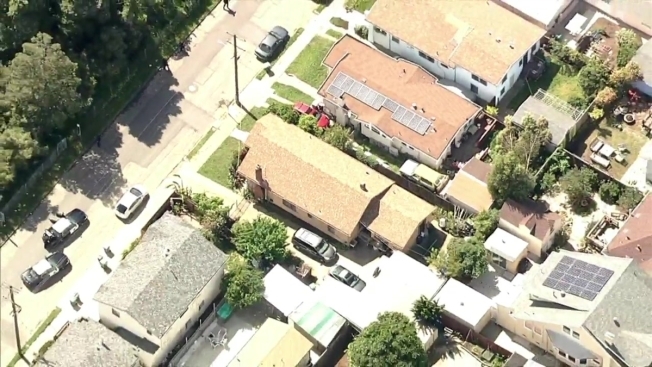 Video from NBC Bay Area's SkyRanger showed one of the suspects hop out from the moving car, a black Mercedes-Benz, and run through a neighborhood at the intersection of Maple Avenue and Delware Street. Video also showed the suspect climbing over fences and on top of homes in the area. The suspect eventually surrendered to police. The other suspect was also detained, officials said. Oakland police have detained robbery suspects following a vehicle pursuit on Thursday afternoon that went through the city and a portion of Interstate 880. Sharon Katsuda reports. Police said the incident started when officers spotted the car, which was tied to a robbery. Officer attempted to pull the car over, but the suspects took off. An Alameda County Sheriff's Office helicopter was called in to help follow the car while police units kept their distance during the pursuit. At one point, the suspect vehicle got on I-880. Officers at the time were not pursuing with lights and sirens. The suspects eventually got back onto city streets, where police were able to close in with the help of the helicopter. Police are not releasing details on the robbery as an investigation is ongoing.